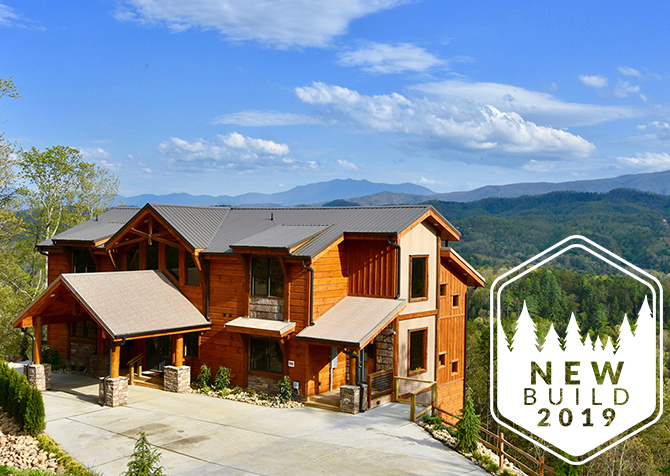 Set on a private five-acre lot (adjacent to a 5-acre lot containing its sister cabin, Eagle River), this luxurious Smoky Mountain lodge boasts stunning mountain views, beautiful furnishings, rustic wood and steel finishes, top-of-the-line amenities, and custom touches throughout. In this industrial-style group lodge, no detail has been overlooked. 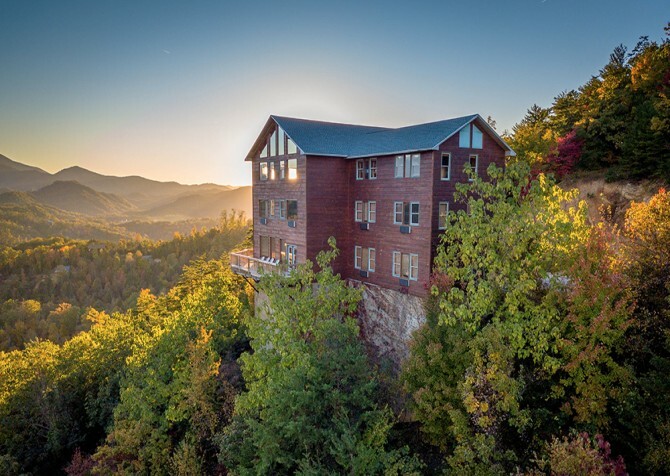 Along with the restored-wood-look floors and tongue-in-groove white pine, Mountain Cascades Lodge features almost 12,000 square feet of barn-style and reclaimed wood. There is room for 26 guests, and every bedroom features its own spa-like bathroom – a true retreat for every guest. It's also just a few miles from downtown Pigeon Forge, offering convenience without sacrificing privacy. As you step through the double front doors of this luxurious lodge, you'll be greeted by gorgeous views through the huge windows running all along the back wall. The elegant entryway is just the beginning of the high-end style found throughout the entire cabin. It features a large eagle carving, Western spruce pillars, and a log bench where you can sit to kick off your shoes. 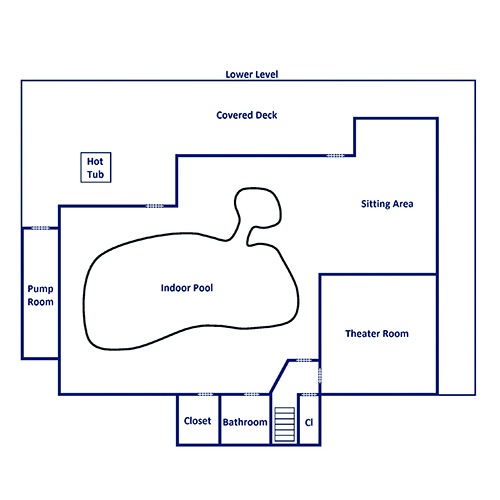 Here you'll also find a closet with iron and ironing board and the laundry room where you can wash swimsuits and towels after a dip in the pool or hot tub. Throughout Mountain Cascades Lodge, Southwestern touches add charm and warmth, perfectly juxtaposing the heavy timber and galvanized railings. The living room, spacious and furnished for a group, also feels like home. Whether here for a family reunion, church retreat, corporate weekend, or fun group getaway, friends and family will gather here for peaceful nights and lasting memories. Plush leather sofas and comfy chairs are gathered around a gorgeous stacked stone fireplace that runs all the way up to the soaring ceilings. A timber and steel mantle continues the industrial feel, and a large slice of redwood on the fireplace serves as a stunning piece of rustic art. On cool Smoky Mountain nights, curl up in front of the gas fireplace and enjoy the fantastic views through the windows. The large Southwestern rug is soft underfoot and perfect for crawling kids. Off to the side, watch shows or movies on the 55-inch flat screen TV. This massive space is open to the kitchen and dining area and overlooked by the two lofts, so guests cooking, dining, and lounging can visit with each other. With huge windows all around, you won't have to miss the incredible mountain views when you want to stay comfortable inside. Spacious enough for multiple guests to cook at once, this fully equipped kitchen is a chef's dream. Style meets function in the kitchen of Mountain Cascades Lodge with granite countertops, lovely tin ceilings, beautiful hickory cabinets, and double appliances. Large groups will find all they need for meals or snacks around the cabin, including two coffeemakers, two double toasters, a pantry, a Lazy Susan cabinet, and plenty of serving dishes, glasses, utensils, and cooking tools. Tiffany-style light fixtures hang above the breakfast bar with log stools, offering more seating and plenty of counter space for buffet-style meals. Spacious and well equipped, Mountain Cascades Lodge's kitchen is perfectly designed for large groups. Just off the kitchen, the dining area is a beautiful space for large group meals. Log picnic tables with benches and chairs, along with stools at the breakfast bar and a high-top table with four stools, provide enough seating for all 26 guests. Guests won't have to spread out in the cabin for meals – everyone can sit down together. The Tiffany-style light fixtures continue into the dining area, and the log tables are rustic but elegant. With space, an open layout, and warm wood tones, it offers a lodge look with a homey feel. Stock the pantry and refrigerators with snacks, drinks, and plenty of food for meals, so you'll have everything you need when you don't want to take the whole group into town to eat. All of the bedrooms in Mountain Cascades Lodge have their own beautiful bathrooms. They feature granite countertops, rustic vessel sinks, and the privacy each guest wants for getting ready in the mornings and evenings. Next to the bunk room, a double bathroom boasts two vessel sinks and two separate two-piece bathrooms (with a toilet and shower in each). 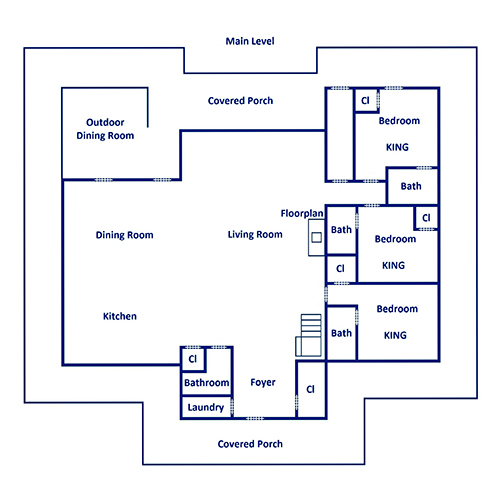 For added convenience, you'll also find a half bath in the kitchen and a full bathroom in the pool room. Located in the loft overlooking the living room, the game room is a fun space for kids and adults to play and hang out. A 42-inch flat screen TV hangs above a pub-style table, and a leather sleeper sofa provides a comfortable place to relax and watch TV as others play a few rounds on the pool table. The cabin also has a new Xbox One, with 2 controllers and several games (specific games not guaranteed)! 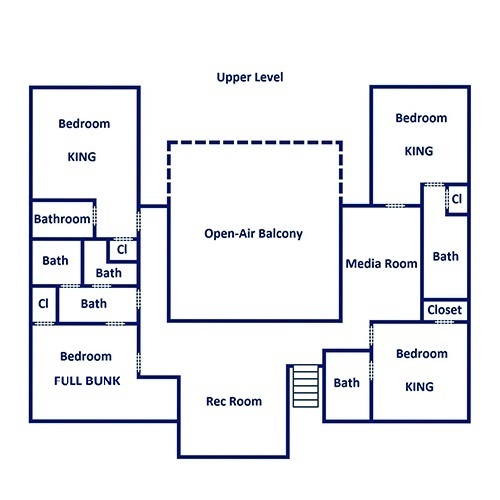 A second loft located between two upstairs bedrooms serves as a sitting area for relaxing and watching TV. Furnished with a 42-inch TV, microfiber sofa, chairs, coffee table, and lamps, this is a great space for chatting or letting kids play. The sleeper sofa here also serves as additional sleeping space if you're traveling with a large group. Boasting an 80-inch TV, Blu-ray player, and comfortable leather seating for nine, the home theater offers the ultimate movie-watching experience. Forgo the uncomfortable theater seats and enjoy lounging in these plush sofas complete with cup holders. The barn-style sliding doors create a unique look, and the Edison-style light bulbs offer ambient lighting when you want the lights out. The kids will love curling up on the bean bags, and there's even enough space for laying out sleeping bags or blankets on the floor. It's the perfect spot to have a movie marathon or watch a big ball game. Offering more than just a pool, the pool room in Mountain Cascades Lodge is spacious and luxurious. . 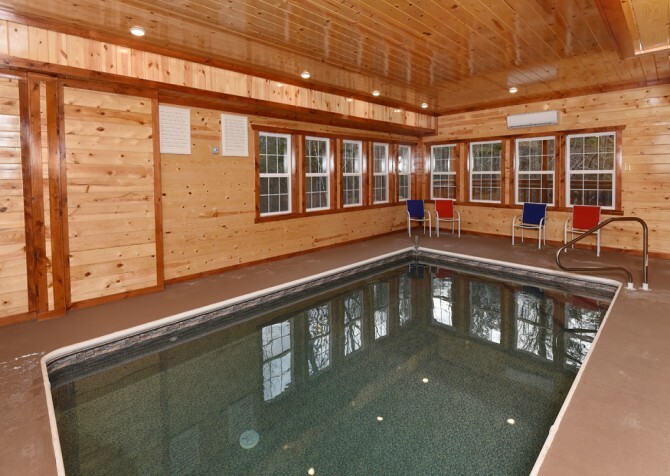 Ranging from 3.5 - 5.5 feet deep, the 16' x 30' heated indoor pool (kept at 87 degrees) features a wading area for kids, a beautiful waterfall feature, a salt-generating chlorine system, a log bridge, and stone details throughout. There is plenty of seating all around the room, including a cushioned loveseat and the dining table for six that's set in an alcove styled after a picnic pavilion. It has a 55-inch TV for those who just want to relax, along with a CD player, DVD player, and sound system. Bring along the kids' favorite movies – they'll love having them going as they splash around in the pool! Every bedroom in Mountain Cascades Lodge is a stylish and relaxing retreat for guests. For restful nights, each bed is outfitted with a pillow top mattress and cozy bedding that will tempt you to head to bed early and sleep in. Spread throughout the cabin, they provide the privacy you want on your Smoky Mountain vacation. Six of the bedrooms have king-size beds and 32-inch TVs, and every room has a closet for unpacking and storing luggage. The Yellowstone National Park room is the bunk room, which will be a favorite with the kids. It's furnished with two full-size custom-made bunk beds, a 42-inch flat screen TV, sleek tin ceilings, and a sleeper sofa for lounging or extra sleeping space. In the Yosemite National Park room, you'll find some of the most spectacular views in the cabin. Gorgeous turquoise bedding is bright and fresh, and the bathroom offers peaceful wooded views. Walk through the loft sitting room and you'll find the Shenandoah National Park bedroom with warm reds and browns. The other upstairs bedroom, the Grand Canyon National Park room, boasts beautiful mountain views. On the main level, find the Grand Teton National Park room just off the kitchen and the Rocky Mountain National Park and Big Basin National Park bedrooms paired to the left of the living room. The Big Basin National Park room has beautiful views and easy deck access through the glass door. Along with the amazing amenities inside, Mountain Cascades Lodge continues to impress with its outdoor spaces. Hand-hewn logs make up the exterior, and a wraparound deck offers tons of space to enjoy the incredible views and lovely Smoky Mountain weather. The covered deck is furnished with lots of cedar rocking chairs and a dining table with cushioned chairs just off the indoor dining area. On the lower level, a six-person hot tub is the ideal place to unwind after a long day. As you sit back with a glass of wine or a cup of coffee, take in the beautiful mountain views and enjoy the serenity that comes with a secluded Pigeon Forge cabin. Fly along more than 8,900 feet of zip lines on 43 private and scenic acres near Pigeon Forge. As you ride, you'll enjoy beautiful views of Mt. LeConte and the Great Smoky Mountains National Park. Take a journey to find secrets, meet new people, and gain magical powers at this unique Pigeon Forge attraction for the whole family. If you came to the Smokies on your motorcycle, be sure to stop by the “best biker bar in Pigeon Forge.” Watch TV, listen to the jukebox, and enjoy a burger in this laid-back atmosphere. "We stayed at Mountain Cascades Lodge and LOVED IT! The kids loved the beautiful pool and the adults loved having two of every appliance in the kitchen! Amazing views, cozy living and comfy beds! We had a total of 21 people in our group, and it was perfect! Teens loved watching movies in the theater room as the guys played pool. Drinks on the back deck and lots of fun! We will definitely be back!" "Beautiful cabin!! This cabin had everything: amazing view, comfy beds, close to nature, an INDOOR POOL with plenty of towels. You can't really beat it. Make sure you follow the directions provided to get to the cabin. (Hidden by Airbnb) maps is incorrect. You do take a gravel road to get there with steep drop offs, so be careful if arriving after dark! Aside from that, I have zero complaints." "Great views and good enough to have a secluded mountain getaway or a tourist adventure in the city!"